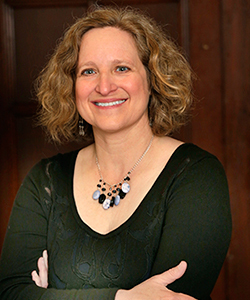 The Teach Don’t Preach Video: You can now see a video, Teach Don’t Preach, that includes an interview with me about Faith Ed as well as interviews with a Wellesley, Mass., middle school teacher and social studies chair featured in one chapter of the book. Backstory: A group of students from Housatonic Valley Regional High School in Conn. made the film as part of the Civic Life Project. Pros advise teens as they make a documentary about a current issue. I traveled to Hartford last week to see an airing of Teach Don’t Preach as well as several other films by students around the state. It’s worth going to the project website and seeing all of the films, which were shown in a legislative building before some lawmakers. Another film called Mistrust really stood out. It looked at the relationship between African Americans and police. 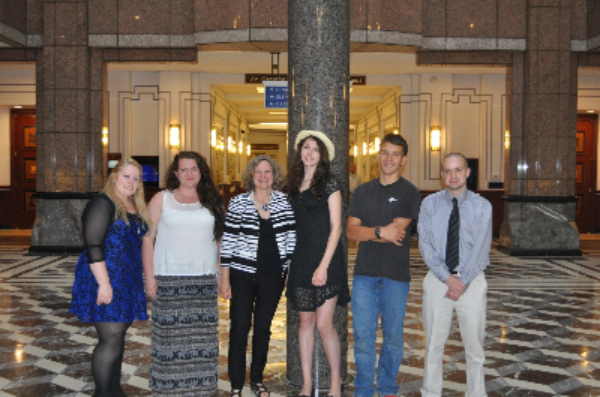 Pictured left to right at the Connecticut State Capital – the Civic Life Project team from Housatonic Valley Regional High School: Shelby Macchi; Rebecca Dubray; me; video director/producer Elizabeth Riccardelli; Nick Winsser; and their teacher, John Lizzi. 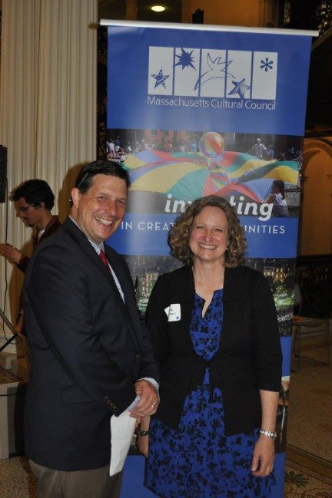 A Visit to Another State House: This week, on Tuesday, I was one of several Massachusetts Cultural Council artist award winners honored in a reception at the Massachusetts State House. We were feted with whoopie pies, bottled water, and fresh fruit, speeches by lawmakers committed to sustaining the arts, and a wonderful video of past recipients talking about how much the award meant to them. As for me, winning an MCC grant was a needed boost of confidence as I worked on Faith Ed. I won for an excerpt from the first chapter and was still in the midst of reporting and writing the rest of the book. It was a great affirmation. You can see a peek at that early excerpt (which has changed slightly in the final version) at this link. You’ll notice that the title of the book is slightly different. It misses the word ‘about’ in the subtitle. We later decided to change it to ‘about’ to make sure no one thought this was a book about preaching religion. At the MCC reception, I met up with fellow award winners who also have strong ties to Grub Street in Boston. Two are in the novel incubator program, while another has taken courses and taught them as I have. 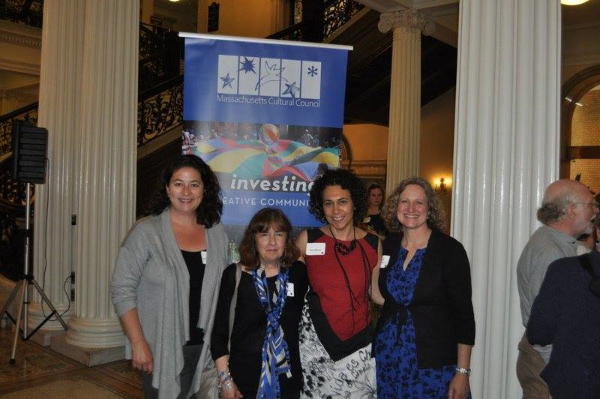 Pictured L to R are: Susan Donovan Bernhard; Emily Ross; Sari Boren and me. I also had fun chatting with Greg Liakos, the MCC communications director, at the event as well. Many thanks to my husband, Pavlik, for taking these photos. Pictured: Former Lumberton, Texas, high school geography teacher Sharon Peters. I visited her at her home and she showed me the clothes that caused the stir in her community. 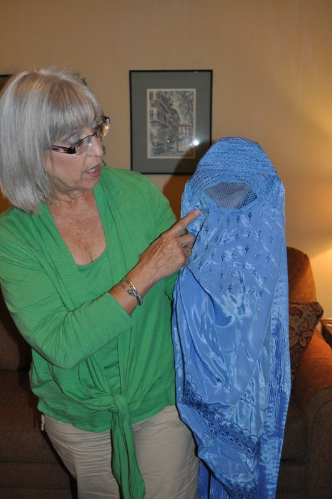 She let students try on this blue burka as well as other items. The excerpt above refers to this story. 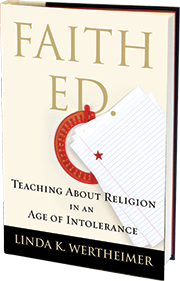 Still Time to Win a Free Copy of Faith Ed: A Goodreads giveaway for my book runs until July 21, courtesy of my publisher, Beacon Press. You can enter by going to this link and vie to be one of 20 winners. Here’s the latest look at confirmed events for Faith Ed. Aug. 18 – 7 p.m. Launch at Porter Square Books in Cambridge, MA. Aug. 25 – 7 p.m. Reading at Tewksbury Public Library, Tewksbury, MA. Labor Day Weekend: Decatur Books Festival, Decatur, GA.
Sept. 10: 7 p.m. Newtonville Books, Newtonville, Mass. Reading, followed by a q-and-a with fellow author, Katherine Stewart, who wrote the Good News Club after getting concerned about Christian clubs at her daughter’s school. Sept. 17: 7 p.m. talk & panel discussion/Q&A afterward with interfaith clergy at the new Lexington Community Center, Marrett Road in Lexington. Cary Library is sponsoring the event. Many thanks to Peggy Stevens, leader of Kids4PeaceBoston, for agreeing to act as moderator for the panel discussion. Tagged Civic Life Project, Faith Ed, Linda K. Wertheimer, Lumberton, Massachusetts Cultural Council. Bookmark the permalink.